RPC Containers has created a unique bespoke plastic container for the latest car care innovation from Tetrosyl. 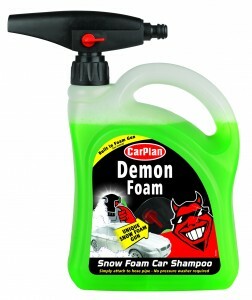 CarPlan Demon Foam is the only car shampoo on the market able to dispense a dense snow foam simply by attaching a hose pipe, without requiring a pressure washer. A special ‘Foam Gun’ allows users to switch between rinsing and foaming and a pack solution was required to enable this to be easily stored in and fixed to the pack, while at the same time effectively communicating the concept to the consumer. RPC Design worked closely with Tetrosyl to develop a special container with a deep recess at the rear where the Foam Gun is held during transit and in-store. In addition, a hole that runs through the centre of the pack enables consumers to see the applicator when the pack is front facing on-shelf. The Foam Gun screws onto the container and links to a dip tube which is held in the neck and controls the flow of product to create the foam once a hose pipe is attached. A large handle allows consumers to hold the container securely while in use. The eye-catching two litre natural HDPE bottle enables the green snow foam formula to be clearly visible on shelf. 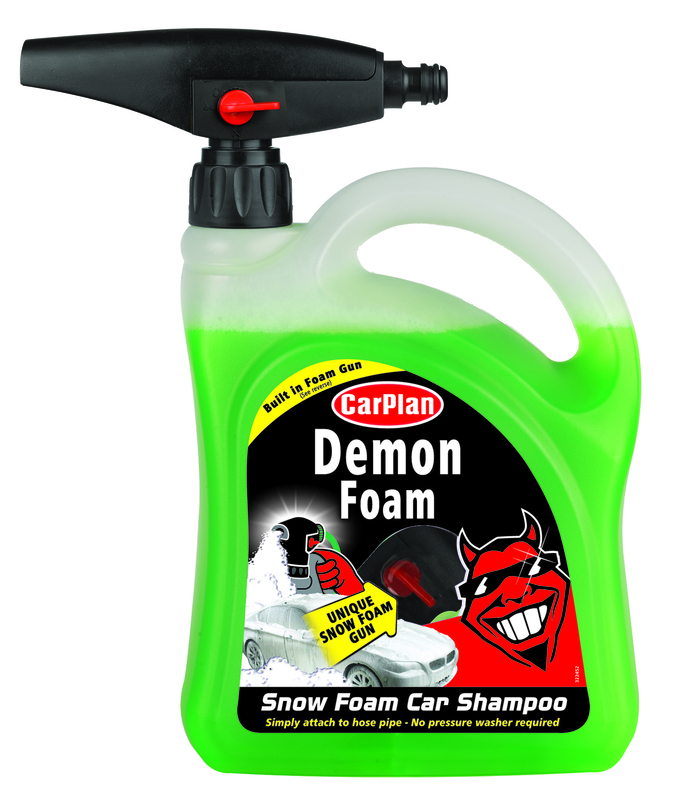 Brand presence is further enhanced by a the large label, which features strong graphics including the distinctive red demon of CarPlan together with a clear section through which the controller for the Foam Gun can be seen. The containers are blow moulded in HDPE at RPC Plenmeller. RPC Market Rasen uses injection-moulding technology to create the inserts that fit into the neck of the bottles and hold the dip tubes in place. These are then fitted by Tetrosyl once the containers have been filled. Marium continues: “RPC delivered everything we asked for and the uniqueness of the bottle is reflected in its multi-purpose action.” Tetrosyl’s Demon Foam is available now in stores nationwide.